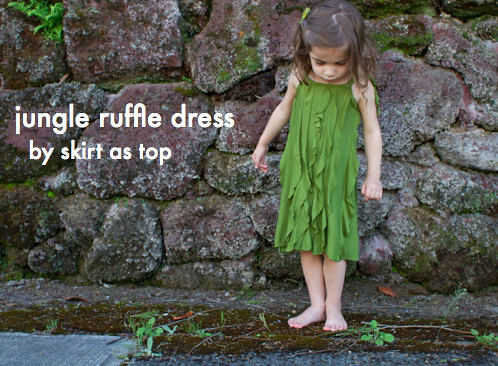 today, i’m reposting a guest tutorial i did for see kate sew’s fun ruffles 2012 series a little while back – a comfy, easy-wearing knit sundress for summertime with plenty of ruffly ruffleness. Hello! I’m so happy to be here as Kate wraps up her awesome Ruffles 2012 series! What fun, wonderful inspiration. It has become apparent that I need to invest in a ruffle foot…but the project I’m sharing with you today does not require one! And no basting-and-gathering either! 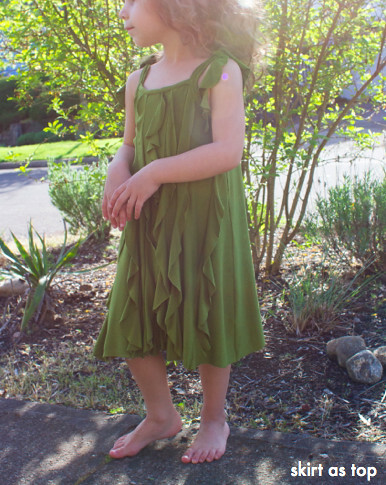 I decided to recreate a store-bought vertical ruffle dress that my daughter wore to bits last summer. It’s soft jersey knit with lots of twirly swishy ruffles for the dancing girly girl. This dress is practical, ridiculously comfortable, and she loves to wear it because the ruffles bounce and move as she does! Since it looks like vines, I call it the “Jungle Ruffle Dress,” though of course it can be made in any color. Cut out a simple a-line sundress body. I used the free oliver + s popover sundress as my rough guide, though I noticed as I went it was going to be too narrow, so I added insets to the side seams (later). Cut it more a-line than you see here if you want to keep it all one piece. Fold the front in half and press, then fold each side to the midline and press, then fold the two creases together and press. It’s good to crease it, you’ll later cut along the creases. Now make the ruffles. The ruffle effect happens because you are cutting the fabric in circles and opening them up. 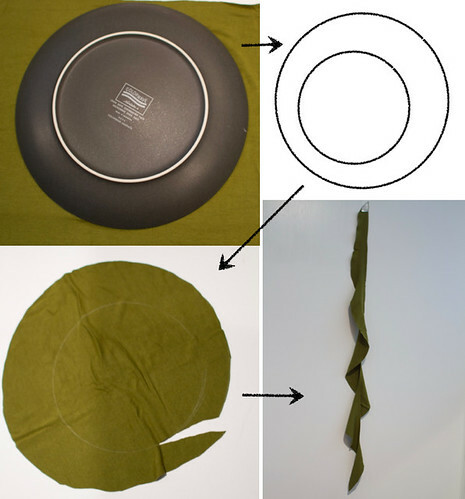 I used a dinner plate and then a smaller bowl to create my two circles – experiment with the size of bowls/length you need on some scrap fabric. You want the length of your opened up circle to be at least as long as your dress. I made my inner circle a little off-center, which will vary the width of the ruffle from top to bottom. The narrow side of mine is about 1″ wide, and the wide side is about 2″. Cut around the inner circle, and trim the edges so they’re smooth. It doesn’t have to be perfect, and I think it looks more interesting if there’s a little variety in the ruffles. Once you’ve made the desired number of ruffles, start sewing them into the dress. Cut along one crease line (just one at a time!). Open up each ruffle and sandwich the inner edge of the circle between the right sides of the main dress. Pin and sew or serge (I’d recommend matching serger thread – mine is white for clarity/because I’m lazy). Repeat for all ruffles. 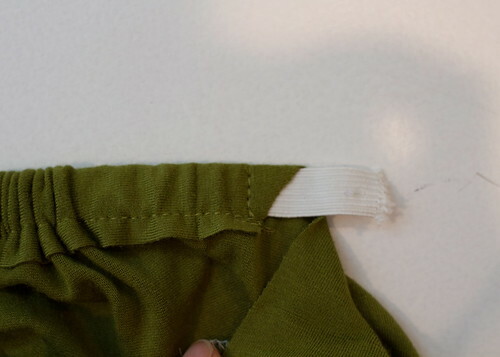 If you’re simply serging, you may want to run a few stitches back and forth with your regular machine to reinforce the bottom seams – when I serge without hemming, the edges tend to come undone over time. After I’d added the front ruffles, I realized the dress would be too narrow at the bottom, so I added a panel to each side to give it more room. 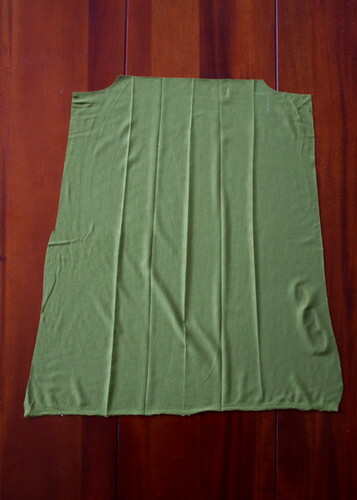 You’ll want the top to be pretty narrow so it doesn’t expand your armhole (just about 1″ so it disappears into your seam allowances), and the bottom of the panel can be a few inches (mine was 4″). Above is the shape. I added another ruffle to the front side when I pieced it with the main dress to camouflage it. Press your seams well, pressing each ruffle in whichever direction you want it to fall. For the back, you could repeat the process with more ruffles, but I decided to just fold the top down to create a casing, then threaded 1/2″ elastic in to gather it to about half the size of the original width. 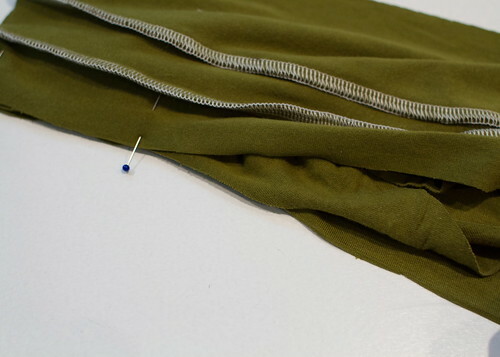 Sew on each side to secure, pull the elastic tight, and trim. 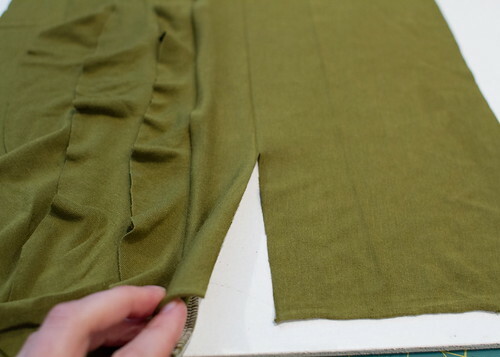 For the front yoke, cut a piece of jersey about 2″ tall and a little wider than the ruffled top of the dress. 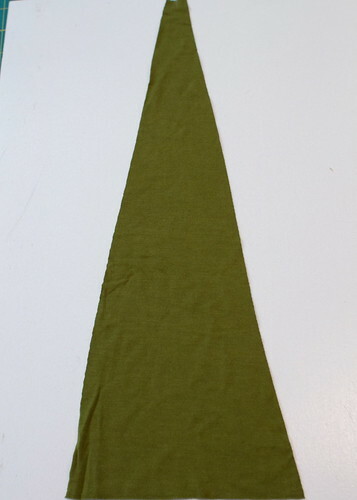 Pin and sew right sides together, then fold the band over the top of the dress, encasing the edge. Topstitch (walking foot is good here), then sew the front and back side seams, right sides together. To bind the armholes, I made two smaller ruffle strips out of the inner circles left over from the front. Make sure they match each other in length and general shape. I stitched each on around the right side of the armhole, then double folded them to the inside and topstitched. The ends knot over your little gal’s shoulders and will curl to add just a bit more ruffle to an already ruffly dress. Trim the bottom of each ruffle to match the hemline and carefully trim anywhere else that seems a bit uneven…and you’re done! Yay! 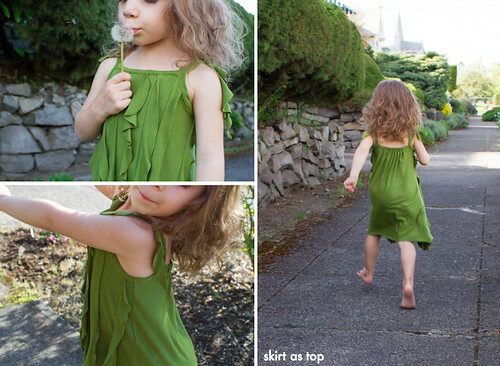 If you make a ruffle dress using this tutorial, please add your photos to the skirt as top flickr group! Thanks so much for having me, Kate – this has been such a fun series! lovely dress! I have yet to make something with that cascading ruffle technique, maybe it is time :). Love the color of your knit! love the ruffle technique you used… very cute! I love how gorgeous this is – yet still comfy and casual, and with so many unfinished edges, definitely less intimidating. So perfect! loved it then . . . love it still now! what a perfect summer dress:) I can imagine that it is a favorite of your daughter’s. cute cute cute! looks like swirly whirl fun for em. i might have to sew one of these up! woo, that’d be awesome if you did! thanks for the tutorial! i think this is too cute! ill pin it and hope to get back to try it one day!